Communities first and Bettws Youth club held a football tournament on Halloween funded by the SRtRC Grants Project. Over 60 young people attended Bettws Play football centre to take part in a football tournament supported by the campaign. The tournament was arranged to highlight anti racism and community cohesion while putting on an activity during Halloween to discourage anti social behaviour. Before the matches started the young people showed their support by posing for a photo holding up the red cards. They all received Newport County FC and Cardiff City FC club posters. 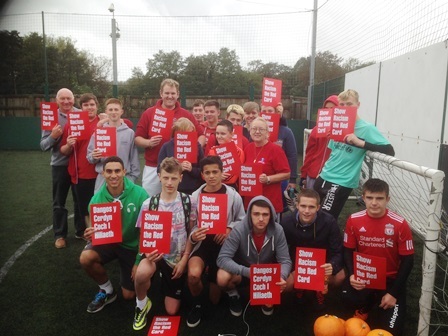 The tournament was part of the SRtRC Fortnight of Action grants funded by the FAW.